Arielle is a Boston area actor, singer, choreographer, and violence designer with credits all over Massachusetts and New Hampshire. 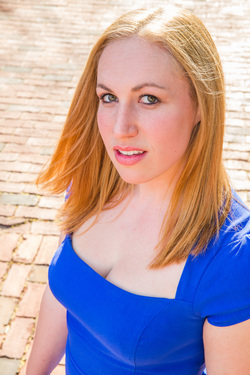 After graduating from Brandeis University with a degree in theatre arts and concentrations in acting and movement, Arielle worked for two years as the resident choreographer for Manchester Community Theatre Players and as an actor in the professional arm of the company, Second Stage. After returning to the Boston area, she joined the cast of Cry Innocent: The People vs. Bridget Bishop in both the title role and as a swing. She also portrays Elizabeth Oliver on The Freedom Trail in Boston. As a violence designer, Arielle first trained with Robert Walsh at Brandeis. Her fight work includes unarmed, smallsword, staff, dagger, and firearm scenes. Arielle's more recent fight credits are from companies such as Company One, MCTP , and Amherst PTA. Recently, Arielle co-founded the Salem, MA theatre company, The Upstart Crows. Their first show, Love's Labour's Lost, was a smashing success and The Crows hope to continue bringing affordable classical works to the city of Salem. On film, Arielle worked with Malarkey Films on the award winning "Love Hurts" from the 2013 Boston 48-Hour Film Festival as actor and combatant, Lady Jayne. She had a featured role in both Stab 5 and Stab 6 as Veronica Clark, and danced with Macklemore in the ESPN College Game Day commercial for 2013. Visit Arielle on IMDB.com here: http://www.imdb.com/name/nm5139019/?ref_=fn_al_nm_1.